Nitrogen Dioxide (NO2) Detectors are used in applications such as bus- and truck garages, under ground garages, road tunnels, engine repair shops, tunnels, engine test benches, shelters, mountain cavities, loading bays with diesel engined vehicles. Nitrogen Dioxide (NO2) Detectors are used to warn when the quantity of harmful gases reaches an unhealthy level. Nitrogen Dioxide (NO2) Detectors are used to ensure that the management of ventilation is done the best and most profitable way, ie. according to fresh air requirements. When the concentration of Nitrogen Dioxide (NO2) becomes too high, the fans starts automatically and stops again when the Nitrogen Dioxide (NO2) concentration has down to the predetermined level. The Nitrogen Dioxide (NO2) Detectors have a built-in electrochemical Nitrogen Dioxide (NO2) sensor. Numbers of Nitrogen Dioxide (NO2) Detectors per square meter is different depending on local regulations, country regulations and applications. Recommended (role of thumb) is one Nitrogen Dioxide (NO2) Detectors per 400 m2. Mounting height for Nitrogen Dioxide (NO2) Detectors is 0.2 meter above floor. NO2D-series = wall, plastic IP65. NO2B-series = duct, plastic IP65. NO2S-series = wall, stainless steel IP55. NO2A = wall, plastic IP65. NO2K = duct, plastic IP65. NO2R = wall, stainless steel IP55. for Carbon Monoxide (CO) gas detectors and Nitrogen Dioxide (NO2) gas detectors in underground garages, parking houses and tunnels. Nitrogen Dioxide or NO2 gas is reddish-brown in color with a sharp characteristic and with arctic odor is a protuberant air pollutant.This harmful gas mostly found in industries where diesel is used as fuel. Exposure of this gas have harmful reactions over our body parts like eye, throat etc. More exposure of this gas can be the cause of death. So protection from this gas is very necessary and important. In this regard Nitrogen Dioxide (NO2) Detectors can help to a great extent. You need not to worry about the risk related to this injurious gas. 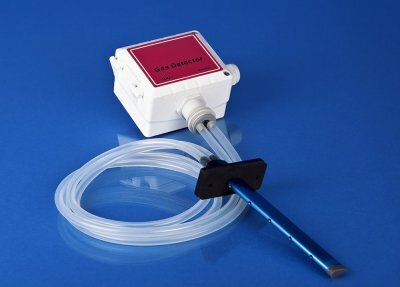 Nitrogen Dioxide (NO2) Detectors can detect the gas quantity and warn when the amount of harmful gases touches a harmful level. This type of detectors are used in different applications liketruck and bus garages, road tunnels, underground garages, engine repairing shops, engine test benches, tunnels, shelters, loading bays with diesel-engine vehicles, and in other places where fuel is diesel such as any industry. Nitrogen Dioxide is produced when hydrocarbons burn. Arrangement of these detectors is a good investment to avoid health problems and to avoid different expenditures. For example if a bus garage have this detector, then the workers get warning if the harmful gas level increase and can do their job properly. To make sure that the arrangement of ventilation is properly done Nitrogen oxide (NO2) Detectors are used. Fresh air must be present as per requirement quantity for a healthy environment.When the level of Nitrogen Dioxide (NO2) becomes high, the fan of the detector startsspontaneously and stops again when the level of Nitrogen Dioxide (NO2) has down to the required level. These detectors have a built-in sensor to detect this unhealthy nitrogen dioxide gas.When Nitrogen Dioxide gas level is high, you can also listen a warning horn. This horn indicates that your environment needs fresh air to reduce this unhealthy gas. 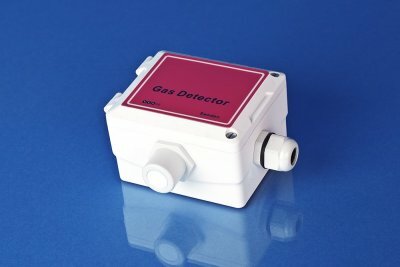 There are different types of Nitrogen Dioxide (NO2) Detectors are available in attractive designs. But in all designs some components are same. Almost all design includes flashing light, warning lights, heating and warning horn. You can choose any model as per requirement. These detectors have a unique feature to identify the Nitrogen Dioxide gas level. The fans in this detector works automatically to facilitate the presence of fresh air and to reduce the Nitrogen gas level.According to the version and model of detectors range to detect Nitrogen Gas varies. Some detectors can measure 0-10 ppm, some 0-20 ppm and some can measure 0-30 ppm.These detectors not only try to minimize the harmful gas level but also warn you about the situation. So, you can aware and arrange proper ventilation in your work area. These detectors will help you to manage and work in a healthy environment. Many diseases spread due to Nitrogen gas. If you are aware about the advantages of Nitrogen Dioxide (NO2), you will escape from mishaps occur due to this harmful gas in air. Industries can use these detectors to provide a healthy environment and can avoid risks that may occur due to Nitrogen Dioxide gas.